Bring a skillet sprayed with nonstick spray to medium-high heat. Add beef, mushrooms, and onion. Cook, stir, and crumble until beef is fully cooked and veggies have softened, about 5 minutes. Sprinkle with taco seasoning, and continue to cook until any excess liquid has evaporated. Evenly divide mixture between taco shells, and top with lettuce and pico de gallo. Toss salad ingredients in a medium bowl, and serve with tacos! HG FYI: Other high-volume veggies include cabbage, celery, zucchini, eggplant, yellow squash, asparagus, cauliflower, kale, and spinach. So here's the deal. The world is full of delicious foods that no one wants to live without... like tacos. And since tacos are relatively small (and un-smothered with melted cheese) compared with their cousins -- chimichangas, burritos, and enchiladas -- you might assume eating a couple of beef tacos would be a safe bet. Wrong-O, wishful thinker! Fatty meat plus frequently fried shells equals cuckoo nutritionals! 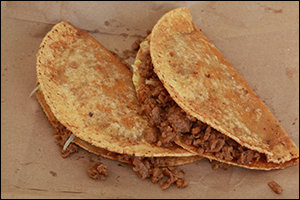 Does this mean you're destined to a life without crunchy tacos crammed with juicy beef? NOPE! That's not how we roll, and you know it. Our recipe -- as featured in the just-printed pages of The Hungry Girl Diet -- is much lighter than traditional tacos, and it includes a bonus side salad for a mega-satisfying meal. 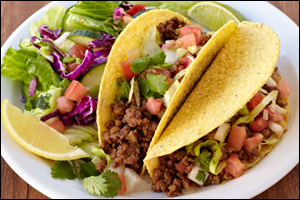 So if you're interested in losing weight while eating the foods you love (LIKE TACOS! ), grab your copy of The Hungry Girl Diet today. Share this awesome book-exclusive recipe with all your pals -- click "Send to a Friend" NOW!